As his committee weighed a sugar-sweetened beverage tax in February, Rep. Mike Fisher (D-Lincoln) asked a simple question of industry lobbyist Andrew MacLean: Just how much money had the American Beverage Association spent on an ad campaign slamming the proposed tax? MacLean told the House Health Care Committee chairman he'd get back to him. Then he reversed course, telling lawmakers and the media they'd have to wait until the official reporting deadline this week. The beverage industry spent an astounding $606,000 on lobbying and advertising in the first three months of the year as it fought to kill the soda tax. In that time, according to records provided by MacLean and the secretary of state's office, the Vermont Beverage Association and the American Beverage Association paid Vermont-based lobbyists $32,000 and $21,000, respectively. The latter group, meanwhile, spent $553,000 on a statewide newspaper and radio advertising campaign. "I had no idea how much of a jobs bill this was," Fisher quipped upon learning the figures. "It's an impressive amount of money they spent trying to influence our decision on a sugar-sweetened beverage tax." Though Fisher's committee voted 7-4 in favor of a one-cent-per-ounce tax that would raise $24 million, the House Ways and Means Committee later quashed the plan in a 6-5 vote. The tax didn't make it out of the House and hasn't been seriously considered in the Senate. MacLean concedes his clients spent "a lot of money" on a "very aggressive campaign" to halt the tax. "I have not been involved in a campaign that's that expensive," he says. "But I've also never been involved in a fight over a tax as drastic as that." MacLean argues that the lobbying bill accounts for just a fraction of what the tax would have cost his industry. He says it would've hit the Coca Cola Bottling Company of Northern New England with a $5 million tax bill. That company's payroll is $6.5 million, he says. "We felt it was important to get our message out," he says. "Obesity is a complex situation and our industry was being attacked." It's unclear precisely how the beverage industry spent its money, though MacLean says it focused on print and radio ads. Organizations seeking to influence debate in the Statehouse must only report the overall cost of lobbying and advertising. And they must only do so three times a year. The figures reported this week only include expenses incurred between January 1 and March 31 of this year. It's quite likely the total bill will have grown in the final weeks of the legislative session. For instance, the conservative super PAC and advocacy group Vermonters First this week reported spending $47,000 on advertising and lobbying in the first three months of this year. But just last week the group launched a statewide direct mail campaign hitting Democratic House members for voting in favor of a slew of new taxes. How much the group will have spent throughout the legislative session won't be clear until July 25, the next lobbyist filing deadline. 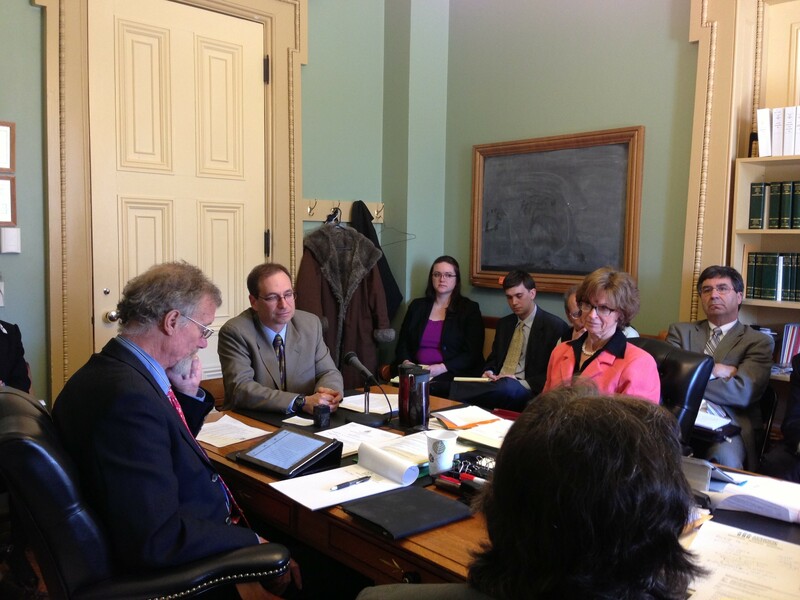 When Fisher first raised the issue with the Vermont Press Bureau's Peter Hirschfeld in March, he argued that organizations employing lobbyists should be required to disclose how much they're spending while the legislative debate is still ongoing. He suggested the legislature adopt rules similar to those governing elections, during which candidates must immediately disclose big ad buys in the closing days of a race. Fisher brought that suggestion to the Senate Government Operations Committee last month (pictured above), but it declined to act. "Everybody I've talked to says, 'Gee, that's an interesting idea,' and agrees with it in concept. Nobody's articulating any opposition to it. So it's a little curious to me that it's not moved yet," Fisher says. "But sometimes it takes a while to get things done here."